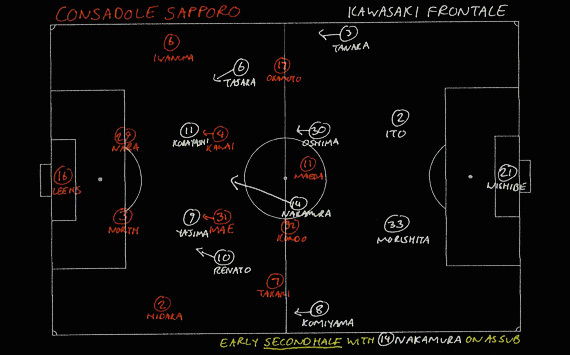 This week’s blackboard looks at a five-goal thriller at the Sapporo Dome last Saturday. 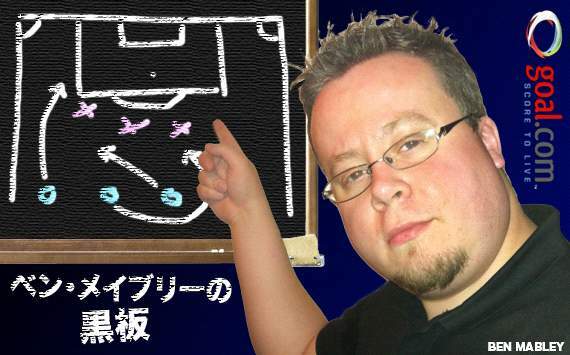 After seven days’ absence for the Japanese Golden Week holiday, both the tactical column and the usual articles here at Football Japan (which have been on a brief hiatus for the past month) will return in the second week of May. Home side Consadole Sapporo take a 2-0 half-time lead and look set to record their first victory since returning to J1. Then Kengo Nakamura comes off the bench and a resurgent Kawasaki Frontale win 3-2. It all makes for a very nice headline. But was it really that simple? Throughout the first half, Sapporo played as if they accepted that their opponents should be superior but were prepared to compensate with greater mental strength and dexterity. They began the game with such a wonderfully fluid front four that it was difficult for Kawasaki to assess and respond to their shape. Defensively, while the back line and two deeper midfielders pressed to a moderate degree, their narrowness without the ball was key in inviting the visitors to attack the flanks – especially the left, with the overlapping Takanobu Komiyama. Consadole’s greater numerical and physical presence in the middle made them favourites to deal with the incoming crosses; a rather straightforward 4-4-2 made Frontale’s early movement predictable. Kawasaki were quick to retreat upon losing possession, making it hard for the hosts to get in behind them despite their numbers in central areas. 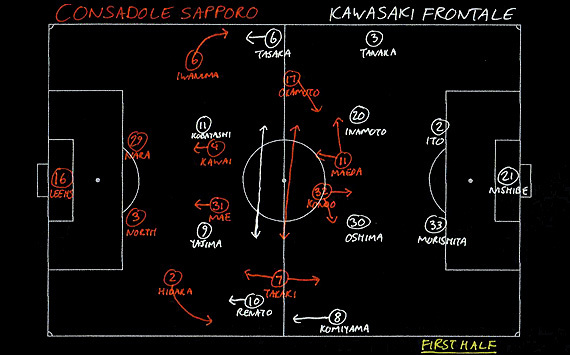 But Sapporo remained patient and, given just two opportunities, demonstrated perfect use of the specific wide options available to them in their 4-2-3-1/4-3-3 formation. For the opener, Shunsuke Iwanuma’s high position at left-back went entirely uncovered, allowing Jumpei Takaki to get in behind the exposed Yusuke Tanaka and cross back for Shunsuke Maeda, who ran across the hurriedly retreating defenders to head home at the near post. Takuma Hidaka was later left unchecked on a right-sided counter to switch for Takaki, dashing inside through the vast spaces that had then opened up on the left. Caretaker boss Tatsuya Mochizuki’s half-time change was more nuanced than systematic. Immediately, Kawasaki looked to play the ball more directly and through the middle, with Renato and Yusuke Tasaka coming slightly narrower while central midfielders Junichi Inamoto and Ryota Oshima, crucially, took turns to break forwards – and, indeed, test the goalkeeper. With this clearly proving likelier to pay dividends as Sapporo were pushed backwards, Mochizuki could withdraw Inamoto for the more naturally creative Nakamura. Fatally, not one Consadole player took responsibility for picking him up in the 21 seconds it took the Kawasaki number 14 from entering the fray to run through the centre and reduce the deficit to 2-1. The momentum suddenly reversed, it was another longitudinal pass from Kengo that drew the equalising penalty; albeit for an admittedly harsh handball decision. Despite a panicked series of personnel and formation changes in the final quarter, Nobuhiro Ishizaki was unable to help his side resist the Kawasaki pressure and pressing for more than a few minutes. At the very end, Sapporo had three central defenders tired and overworked by three narrow forwards, and Tasaka backheeled for Koji Yamase – another substitute – to run in behind Tatsuki Nara and complete the recovery. The flow of this match was re-determined by Mochizuki’s subtle change in emphasis; Nakamura was the ideal player to help him achieve it. Vegalta Sendai feature again in this week’s blackboard column after their successful visit to Kashiwa Reysol on a very rainy afternoon last Saturday. A trip to reigning champions Kashiwa Reysol served up the perfect opportunity for current J1 leaders Vegalta Sendai to lay down a marker as genuine title contenders. They got off to the perfect start with a headed goal from Naoki Sugai before the contest had time to settle, and despite the concession of two equalisers, managed to lead the scores for all bar 15 of the 90 minutes en route to a well-merited 3-2 victory. In a sense, this denied us the opportunity to see how Sendai would take the game to their opponents since the early opener afforded them the luxury of embracing their role as away side. 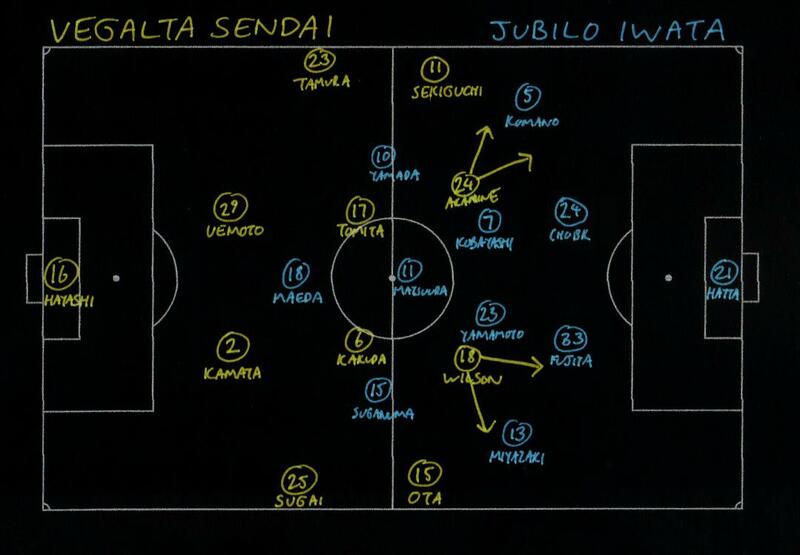 With both teams looking to counter, Kashiwa demonstrated a certain degree of positional rotation between Junya Tanaka, Masato Kudo, and Leandro Domingues early on; while the overlapping runs of Hiroki Sakai completed an attacking quintet with a slight right-sided bias. In response, the visitors’ defence adopted a much deeper line without the ball than they had against Jubilo Iwata last week, while central midfielders Toshihiro Matsushita and Shingo Tomita also dropped right back to sit just in front of them. This had the dual effect of quelling Reysol’s interchanges with well-organised pressing, and of ensuring numerical superiority with six men versus five. The introduction of Hideaki Kitajima for the anonymous Tanaka at half time was a masterstroke because of the different options the 33-year-old could immediately offer in such circumstances: a) defending from the front, b) holding his position to form a strike duo when Kudo got forwards, and c) serving as a target man for long passes out of defence. The latter quality led directly to Kashiwa’s leveller ten minutes after the restart – a long ball from Tatsuya Masushima drawing the aerial foul from Taikai Uemoto on Kitajima and a free kick that was brilliantly converted by Leandro. Within seconds of kicking off, however, Vegalta had pressed themselves back in front. On their right flank, Tomita pressurised Akimi Barada, Shingo Akamine closed down Ryoichi Kurisawa, and Sugai quickly stole in from Jorge Wagner. The Reysol defence was pulled left as a result, and Wilson’s clever individual skill left Kunimitsu Sekiguchi as free to score in the middle as he had been against Iwata. For the hosts, it was back to Plan B. 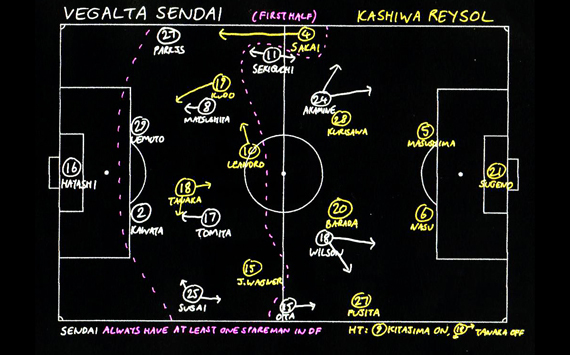 Eventually, they were able to unsettle the Sendai defence with a succession of crosses and set pieces. Leandro equalised again from Masato Fujita’s hopeful cross; though it was massively assisted by Park Joo-Sung’s hesitation and a rare goalkeeping slip by Takuto Hayashi. Finally, for 12 minutes, we had parity. Kashiwa were unable to provoke another mistake despite some sustained possession; Sendai stepped forwards from the back and, with their front two working as hard as ever, looked to bypass the soaking wet midfield with quick balls out wide. In the end, it was Akamine’s reading of the game that allowed him to retreat from his marker and convert a low cutback from Yoshiaki Ota for the winner. My fifth article on J. League tactics for Goal.com features Saturday’s entertaining meeting of the top two at the start of play, Vegalta Sendai and Jubilo Iwata. 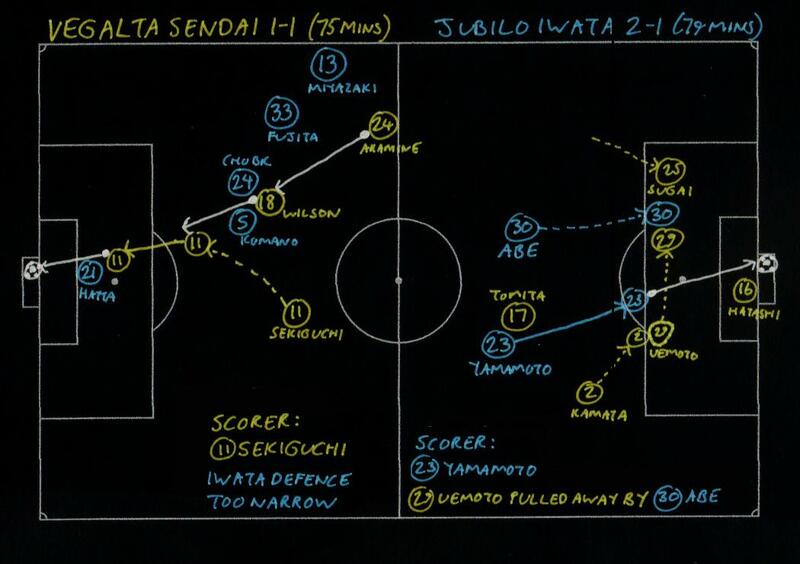 An early top-of-the-table battle, Vegalta Sendai versus Jubilo Iwata provided another different example of what can happen when 4-4-2 meets 4-2-3-1 in an intense encounter of contrasting shapes, styles, and intentions. Most strikingly, this was a contest of two back fours that liked to adopt aggressively high lines, albeit for differing purposes. The home side with the positive 4-4-2, Vegalta used theirs as a launching point for persistent attacking ambitions that sought to push the visitors backwards. Jubilo, however, held firm; pressing the hosts’ forwards and playing very narrowly as a unit to deny them space in central areas. The overall setup was conducive to the way that both sides like to play, though Sendai increasingly became the greater beneficiaries in terms of territory and possession. Iwata settled quickly and looked to get in behind on the counterattack with either pace or balls over the top. After the initial quarter of an hour, however, the side in yellow found their rhythm. They immediately looked to get the ball into wide areas, switching play to the opposite flank if necessary, while either Wilson or Shingo Akamine – the two forwards – would come deep and very wide to help play develop through midfield. As the visitors looked bereft of ideas during sustained possession (and frequently conceded it as a result), it was Sendai who created the chances – albeit rarely gilt-edged ones due to the congestion in the middle. Wilson and Akamine came slightly more inside after the interval and instantly seemed to combine more intuitively, but were frustrated by a succession of offsides. A rare absence of concentration then allowed Iwata to score quite out of the blue; swapping flanks by chance rather than design, Hiroki Yamada cut inside and crossed from the left for an unmarked and unnoticed Minoru Suganuma at the far post. Jubilo paid for their narrowness when Sendai worked a defensive throw-in on the right-hand side across for left-winger Kunimitsu Sekiguchi to run freely into the centre for the equaliser. However, the introduction of Yoshiro Abe for Takuya Matsuura just beforehand pushed Iwata closer to a 4-4-2, distracting Taikai Uemoto and allowing Kosuke Yamamoto to punish a fatally standoffish defence with their second goal from only two real attempts. Hitoshi Morishita’s side could then go like-for-like, dropping slightly deeper and defending the wings more thoroughly. Their patience ensured the hosts looked much less likely to score than they had all game, even (perhaps especially) after the desperate 89th-minute introduction of Atsushi Yanagisawa. Ironically, the last-second equaliser duly arrived anyway thanks to a hopeful Naoki Sugai long ball and the individual magic of Wilson. It was an odd match with three goals coming against the run of play, but the draw was the least Sendai deserved. 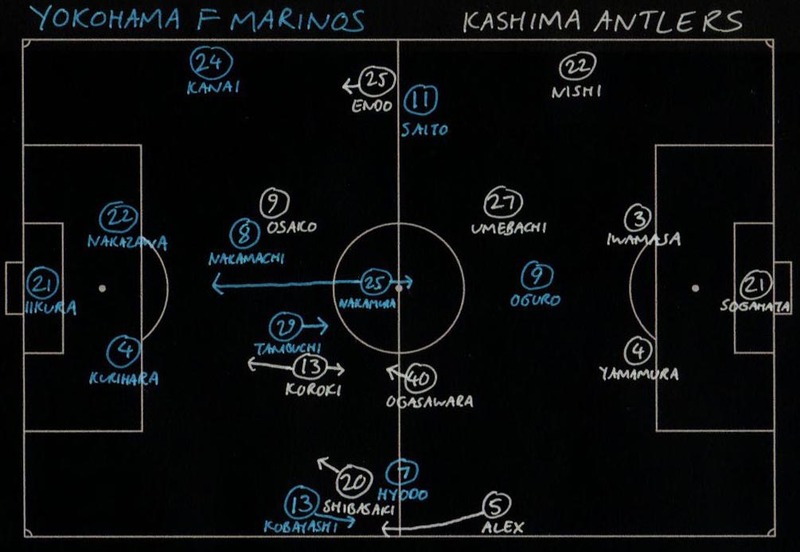 The fourth in my series of tactical analyses for Goal.com looks at the failure of Yokohama F Marinos to function as anything more than an immovable object during their 0-0 draw at home to Kashima Antlers on Saturday. Yokohama F Marinos manager Yasuhiro Higuchi promised us a year of attacking football. Kashima Antlers like to get the ball forwards quickly in their classic 4-4-2. All sounds promising. But this wound up being the only one of Saturday’s nine J1 matches to finish goalless. Why? Well, the atrocious weather hardly helped, but much of the problem stemmed from how the home team lined up. Marinos supposedly deployed a 4-2-3-1 system, but in practice – if not intentionally – it looked suspiciously more like an ultra-defensive 4-5-1. Nominally starting off the striker, Shunsuke Nakamura dropped so deep both with and without possession that he was frequently seen behind the two volante, Hiroyuki Taniguchi and Kosuke Nakamachi. Greater midfield numbers allowed them to pass the ball around nicely at times, but most of this took place on their own side of halfway. Even on the few occasions where the isolated Masashi Oguro was able to support an attack in wide areas, Yokohama had nothing coming centrally (bar, occasionally, Taniguchi) and neither Manabu Saito nor Shingo Hyodo boast sufficient penalty area presence on their own to threaten from long, hopeful crosses. The positioning of Kashima’s back line was hardly aggressive, but a lot of the time, Marinos were positively entrenched. A tone was set in the ninth minute when the home defence retreated behind a Shinzo Koroki dribble and forced him to shoot from distance. Half an hour later, a 30-second spell of Antlers possession saw fully nine Yokohama outfielders drop to within 25 yards of their goal line before Mitsuo Ogasawara’s deflected shot hit the top of the crossbar. The visitors looked for opportunities with quick, longitudinal passes and overlapping runs from Alex on the left – Daigo Nishi on the opposite side was busy effectively neutralising Saito – but Marinos’ wilfully deep defending meant that Kashima’s 11 goal attempts were never more than half-chances at best. Just before the hour mark, the elephant in the room was exposed. Yasushi Endo dispossessed the unusually advanced Yuji Nakazawa just beyond the centre circle, and ran straight through to test Hiroki Iikura from outside the box. A faster, more goal-hungry attacker might have turned it into a better opportunity, but for the rest of the match, Nakazawa practically never left his own third. His ‘Bomber’ nickname is starting to sound sadly ironic – perhaps ‘aircraft carrier’ would better describe his turning speed – and while his outstanding organisational experience was key to Marinos’ clean sheet, the fear of strikers getting in behind has the knock-on effect of pulling the entire eleven backwards. You can appreciate what Higuchi is trying to achieve, but there seem to be a few too many square pegs in round holes at the moment.